Freya (Old Norse Freyja, “Lady”) is one of the preeminent goddesses in Norse mythology. She’s a member of the Vanir tribe of deities, but became an honorary member of the Aesir gods after the Aesir-Vanir War. Her father is Njord. Her mother is unknown, but could be Nerthus. Freyr is her brother. Her husband, named Odr in late Old Norse literature, is certainly none other than Odin, and, accordingly, Freya is ultimately identical with Odin’s wife Frigg (see below for a discussion of this). Freya is famous for her fondness of love, fertility, beauty, and fine material possessions – and, because of these predilections, she’s considered to be something of the “party girl” of the Aesir. In one of the Eddic poems, for example, Loki accuses Freya (probably accurately) of having slept with all of the gods and elves, including her brother. She’s certainly a passionate seeker after pleasures and thrills, but she’s a lot more than only that. Freya is the archetype of the völva, a professional or semiprofessional practitioner of seidr, the most organized form of Norse magic. It was she who first brought this art to the gods, and, by extension, to humans as well. Given her expertise in controlling and manipulating the desires, health, and prosperity of others, she’s a being whose knowledge and power are almost without equal. Seidr is a form of pre-Christian Norse magic and shamanism concerned with discerning destiny and altering its course by re-weaving part of its web. This power could potentially be put to any use imaginable, and examples that cover virtually the entire range of the human condition can be found in Old Norse literature. In the Viking Age, the völva was an itinerant seeress and sorceress who traveled from town to town performing commissioned acts of seidr in exchange for lodging, food, and often other forms of compensation as well. Like other northern Eurasian shamans, her social status was highly ambiguous – she was by turns exalted, feared, longed for, propitiated, celebrated, and scorned. Freya’s occupying this role amongst the gods is stated directly in the Ynglinga Saga, and indirect hints are dropped elsewhere in the Eddas and sagas. For example, in one tale, we’re informed that Freya possesses falcon plumes that allow their bearer to shift his or her shape into that of a falcon. During the so-called Völkerwanderung or “Migration Period” – roughly 400-800 CE, and thus the period that immediately preceded the Viking Age – the figure who would later become the völva held a much more institutionally necessary and universally acclaimed role among the Germanic tribes. One of the core societal institutions of the period was the warband, a tightly organized military society presided over by a king or chieftain and his wife. The wife of the warband’s leader, according to the Roman historian Tacitus, held the title of veleda, and her role in the warband was to foretell the outcome of a suggested plan of action by means of divination and to influence that outcome by means of more active magic, as well as to serve a special cup of liquor that was a powerful symbol of both temporal and spiritual power in the warband’s periodic ritual feasts. This “politico-theological conception” was based on the mythological model provided by the divine pair Frija and Woðanaz, deities who later evolved into, respectively, Freya/Frigg and Odin. Woðanaz is the warband’s king or chieftain, and Frija is its veleda. In addition to the structural congruencies outlined above, Wealhþeow and Freya even own a piece of jewelry with the same name: Old English Brosinga mene and Old Norse Brísingamen (both meaning something like “fiery/glowing necklace”). That both figures refer to the same ancient archetype, whether on the human or the divine plane, is certain. 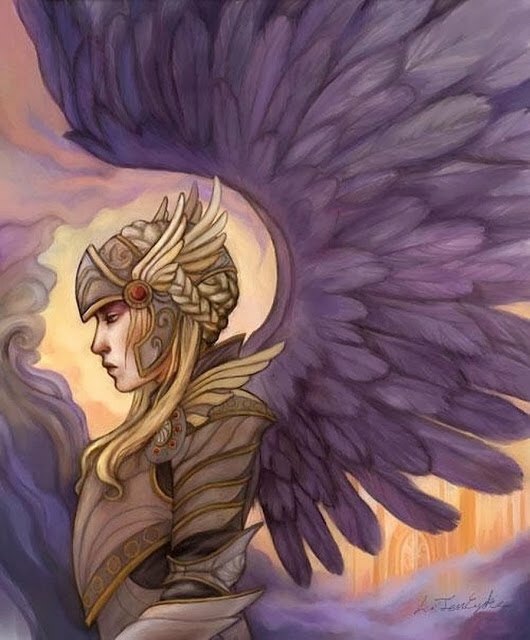 While the late Old Norse literary sources that form the basis of our current knowledge of pre-Christian Germanic religion present Freya and Frigg as being at least nominally distinct goddesses, the similarities between them run deep. 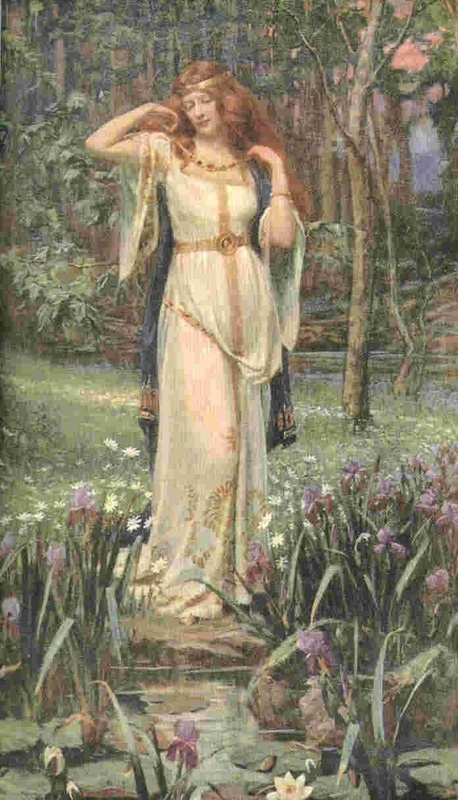 Their differences, however, are superficial and can be satisfactorily explained by consulting the history and evolution of the common Germanic goddess whom the Norse were in the process of splitting into Freya and Frigg sometime shortly before the conversion of Scandinavia and Iceland to Christianity (around the year 1000 CE). 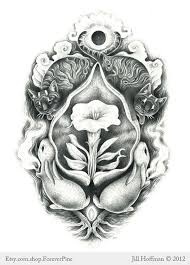 As we’ve noted above, the Migration Period goddess who later became Freya was the wife of the god who later became Odin. While somewhat veiled, this is ultimately still the case in Old Norse literature. Freya’s husband is named Óðr, a name which is virtually identical to that of Óðinn (the Old Norse form of “Odin”). Óðr means “ecstasy, inspiration, furor.” Óðinn is simply the word óðr with the masculine definite article (-inn) added onto the end. The two names come from the same word and have the same meaning. Óðr is an obscure and seldom-mentioned character in Old Norse literature. The one passage that tells us anything about his personality or deeds – anything beyond merely listing his name in connection with Freya – comes from the Prose Edda, which states that Óðr is often away on long journeys, and that Freya can often be found weeping tears of red gold over his absence. Many of the surviving tales involving Odin have him traveling far and wide throughout the Nine Worlds, to the point that he’s probably more often away from Asgard than within it. Many of Odin’s numerous bynames allude to his wanderings or are names he assumed to disguise his identity while abroad. Thus, it’s hard to see Freya’s husband as anything but an only nominally distinct extension of Odin. Freyja and Frigg are similarly accused of infidelity to their (apparently common) husband. Alongside the several mentions of Freya’s loose sexual practices can be placed the words of the medieval Danish historian Saxo Grammaticus, who relates that Frigg slept with a slave on at least one occasion. In Lokasenna and the Ynglinga Saga, Odin was once exiled from Asgard, leaving his brothers Vili and Ve in command. In addition to presiding over the realm, they also regularly slept with Frigg until Odin’s return. Many scholars have tried to differentiate between Freya and Frigg by asserting that the former is more promiscuous and less steadfast than the latter, but these tales suggest otherwise. Frigg is depicted as a völva herself. Once again in Lokasenna, after Loki slanders Frigg for her infidelity, Freya warns him that Frigg knows the destiny of all beings, implying that she also has the power to alter them if she so chooses. Frigg’s weaving activities are likely an allusion to this role as well. 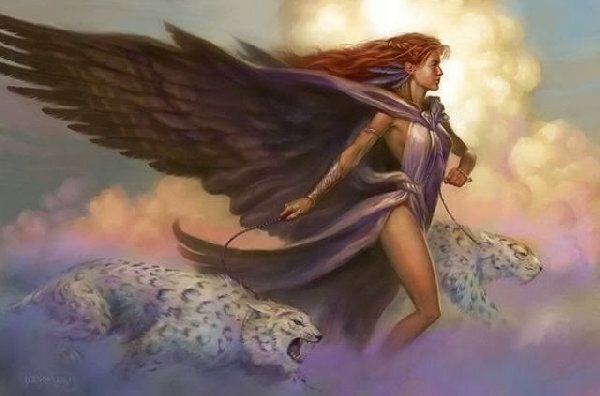 And, as it turns out, Freya is not the only goddess to own a set of bird-of-prey feathers for shapeshifting – Frigg is also in possession of one. The word for “Friday” in Germanic languages (including English) is named after Frija, the Proto-Germanic goddess who is the foremother of Freya and Frigg. None of the other Germanic peoples seem to have spoken of Frija as if she were two goddesses; this approach is unique to the Norse sources. It should come as no surprise, therefore, that in the Norse sources we find a confusion as to which goddess this day should have as its namesake. Both Freyjudagr (from Freyja) and Frjádagr (from Frigg) are used. The names of the two goddesses are also particularly interesting in this regard. Freyja, “Lady,” is a title rather than a true name. It’s a cognate of the modern German word Frau, which is used in much the same way as the English title “Mrs.” In the Viking Age, Scandinavian and Icelandic aristocratic women were sometimes called freyjur, the plural of freyja. “Frigg,” meanwhile, comes from an ancient root that means “beloved.” Frigg’s name therefore links her to love and desire, precisely the areas of life over which Freya presides (perhaps a more theologically correct wording would be “within which Freya manifests herself”). Here again we can discern the ultimate reducibility of both goddesses to one another: one’s name is identical to the other’s attributes, and the other name is a generic title rather than a unique name. Clearly, then, the two are ultimately the same goddess. But this raises the question of why they’re portrayed as distinct goddesses in Old Norse literature. Germanic mythology acquired its basic form during the Migration Period, and is, accordingly, a mythology especially suited to the socio-political institutions and prevailing ways of life that characterized that era. The cornerstone of this schema is the divine pair Frija and Woðanaz, the veleda and the *xarjanaz (“warband leader”) respectively. 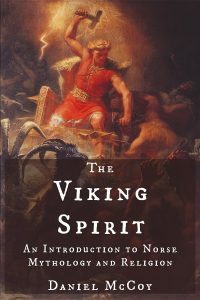 During the Viking Age, the formal warbands of earlier times gave way to informal, often leaderless groups of roving warriors – the vikings. Since the warband was no longer a feature of the lives of the Norse people, the mythological structures that had accompanied it lost much of their relevance. Now that Odin was no longer thought of as the leader of the warband of the gods, nor Freya/Frigg its veleda, the opportunity arose for their roles to be reinterpreted. For unknown reasons, part of this reinterpretation evidently involved splitting Frija into two goddesses, a process that appears to have never been fully completed, but was instead interrupted by the arrival and acceptance of Christianity. Day of the Goddess Freya, called unlucky by Christian monks, because everything associated with female divinity was so called. Friday the 13th was said to be especially unlucky because it combined the Goddess's sacred day with her sacred number, drawn from the 13 months of the pagan lunar year. Romans named the day dies Veneris after Venus, their own version of the same Goddess. In modern French, Friday is still vendredi, and in Italian, venerdi. Friday used to be the seventh day of the week. It was the Sabbath of the Jewish lunar calendar and is still the Sabbath of Islam. Scandinavian pagans, Hindus, and rural Scots insisted that Friday was the most propitious day for a marriage because it was the day that favored fertility. Fish were eaten on Friday as fertility charms, in honor of Venus (or Freya) whose totems they were. Fish are still considered "aphrodisiac" food because they were sacred to Aphrodite. Thus the Catholic habit of eating fish on Friday was wholly pagan in origin. But the church never acknowledged the debt. In the Middle Ages, when pagan votaries of Freya continued to celebrate her rites on Friday, churchmen designated her day as the day of "devil worship."